Curated events by the Center for the Study of Transformative Lives speak about the importance of exemplary lives, and do so consciously with a focus to inspire others. We study exemplary lives to broaden our own, and to embolden us to new acts of courage and compassion. Our event programming is always open to the public, and what have affectionately been called "transformative evenings" are often photographically documented to capture the moment in time. 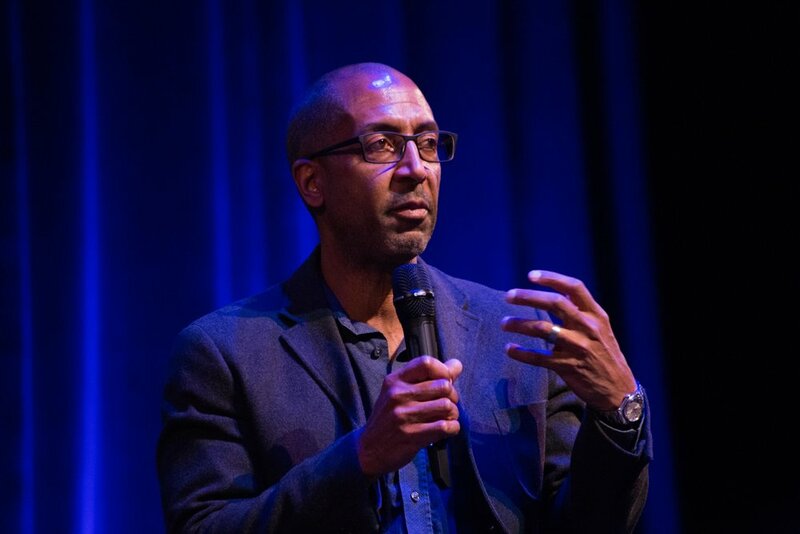 November 13th, 2018 - The Center welcomed author Andrew Delbanco to discuss how fugitive slaves in America exposed the contradiction between the myth that slavery was a benign institution and the reality that a nation based on the principle of human equality was in fact a prison-house in which millions had no rights at all. April 9th, 2018 - The Center’s largest event for the spring of 2018 involved building the most diverse audience to date that we have brought together, to focus on the transformative figure of Martin Luther King Jr. just days after the 50th anniversary of his assassination. The pre-film panel and screening took place in the largest NYU venue–Skirball Theater– and drew a crowd of many hundreds. The moderated a panel discussion featured Columbia film professor Trey Ellis, an Executive Producer of the film, and the legendary historian David Levering Lewis. Following the panel, the new documentary film “King in the Wilderness,” created for HBO by the Center Director's brother, Peter Kunhardt, was screened. February 20th, 2018 - The Center and the NYU Biography Seminar co-hosted an extraordinary evening with distinguished biographers Richard Stengel and Xolela Mangcu. The evening covered the life and legacy of the first black South African president and was followed by a stimulating Q&A. November 6th, 2017 - The Center and the NYU Biography Seminar co-hosted an extraordinary evening with Pulitzer Prize winning author Ron Chernow. The evening covered one of the most compelling of American generals and presidents, Ulysses S. Grant and was followed by a stimulating Q&A and book signing. September 28th, 2017 - As its opening fall event, the Center hosted the distinguished scholar Laura Dassow Walls, author of the first comprehensive biography on Thoreau in more than fifty years. March 28th, 2017 - As its premiere spring event, the Center hosted the distinguished biographer Megan Marshall to discuss five women she has written deeply about: The Peabody Sisters (Elizabeth, Mary, and Sophia), Margaret Fuller, and Elizabeth Bishop, with whom Marshall studied with at Harvard.